Home » Blog » Update On Small Business: Instant Asset Write-Off Extended Until 2020! Update On Small Business: Instant Asset Write-Off Extended Until 2020! The instant asset write-off has been creating a lot of buzz in Sydney since January when the federal government announced about the extension of its deadline till 2020 and an increase of $5000 in its threshold value. The changes are a step towards boosting the confidence of small business owners in Australia whose annual turnover is less than $10 million. However, many are still unaware of this proposal which can prove highly beneficial for this segment operating in Sydney. In simpler terms, the legislation will increase the instant asset write-off threshold level from $20,000 to $25,000, and the last date of the scheme has been moved to 30, June 2020 from the original 30, June 2019. If you are still baffled about this plan, let our expert bookkeepers in Sydney take you through the details of this initiative which will strengthen the foundation of small enterprises. It has been estimated that almost 3 million small businesses will be able to take advantage of this write-off. The legislation will bring tax deductions to the forefront thereby enhancing the flow of cash which will allow the business owners to reinvest their money into their ventures. Whether they are located in Chatswood, Randwick, or Parramatta, it will put them in a better position to upgrade or replace their assets. The instant asset write-off provides small business enterprises with the benefit of claiming immediate deductions of up to $25,000 for new or second-hand assets. The eligibility criteria state that the assets must have been purchased on or after 12 May 2015 and utilised or installed between 29 January 2019 and 1 July 2020. Those depreciating assets which do not fall under this timeframe requirement will continue to utilise the $1000 threshold. The assets can comprise both plant and equipment including tools, office machinery, and vehicles. 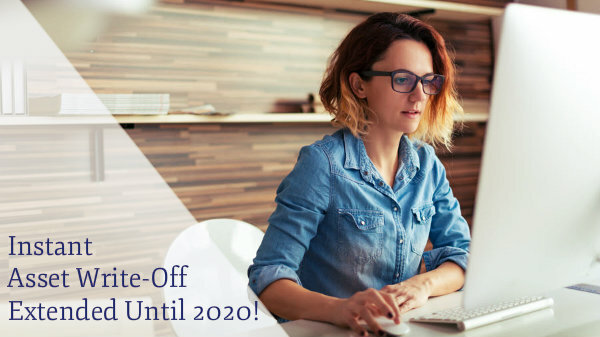 With the extension of the timeline until 2020, you still have ample time to claim the deductions using the services of a seasoned bookkeeping company. This initiative allows small businesses in Sydney to claim a deduction for the asset in the same financial year when it was purchased. The federal budget 2019 is trying to include the medium-sized enterprises into this program with the extension of the instant asset write-off threshold to $30,000 for businesses generating less than $50 million. According to reports, over 350,000 small businesses had already taken advantage of the write-off, and this increase will add another 20,000 to the list. This means that more and more small and medium-sized businesses will be buying assets which will enhance the commercial activity and lead to the creation of more jobs. You must consult your bookkeeper to stay updated with all the new tax cuts and legislation being passed by the government to take advantage of these schemes. Which Purchases Should Be Made By The Business Owners? As the owner of a small business organisation, you must consult with your bookkeeping company in Sydney before spending on any existing or new assets. The bookkeeper will evaluate the advantages of acquiring the asset and its impact on the flow of capital in the organisation during the purchase period. If you intend to make the most of the new legislation, you must ensure that whatever you buy is actually beneficial for your business and the health of its bottom-line. For example, if you purchase industry-grade new equipment, it will allow you to improve the productivity of the business as well as assist in meeting the objectives laid down in your business plan. What If The Purchase Goes Beyond The Threshold? The threshold of $25,000 indicates the asset’s total cost and not just the taxable part. Thus, if the items purchased for the business cost $25,000 or more than this value, then they can be categorised into the small business assets pool. You can claim gradual deductions every year for the same with the help of your bookkeeping company. For example, if you purchase a machine for $40,000 but end up utilising only half of its capacity for your operations, then you can assign $20,000 to the asset pool. However, you won’t be able to claim the instant asset write-off. You must keep this vital fact in mind that the write-off does not provide the business with any cash refund. It only brings the tax deduction forward. The tax benefit is then based on the applicable marginal tax rate of the business owner which will be calculated by the bookkeeper. The Labor has recently announced a new tax cut under the Australian Investment Guarantee which will allow small businesses to claim deductions of up to 20% during their first year of investments in depreciable assets that cost more than $20,000. While the instant asset write-off is a temporary measure, this new tax cut is being welcomed by industries as it will be a permanent feature. Whether you own a business in the suburbs like Chatswood, Randwick, and Parramatta, or the urban metropolis like Sydney, this scheme encourages you to purchase assets and expand your business. An important thing to be kept in mind is that every business is not eligible for the write-off. However, most of the assets are eligible, except a few listed by the ATO. Check with your bookkeeper to know all the details of the eligibility criteria and whether you fall within it. The scheme lays down certain eligibility conditions and is otherwise pretty simple to understand. The requirements are that the total cost of the asset should be less than the threshold value, regardless of any trade-in money. If the business owner decides to sell or dispose of the asset for which the write-off was claimed, then he will have to include the taxable purpose proportion of the sum received for the asset in his assessable income. Additionally, if the asset bought under the program is partly used for personal work, the percentage of personal use cannot be taken into consideration while calculating the proportion that can be claimed. In case of any uncertainty related to what can be bought under the legislation, you must consult a seasoned bookkeeper who can advise you about the same. The instant asset write-off aims at amplifying the investment of owners into their own businesses through the purchase of assets which will boost the economy and lead to higher employment. The recent changes can help you build your empire and reach a sustainable position.